What’s more scary than a tired mom? She’s like a ticking bomb, she can expload any second! This girl’s Halloween costume can be felt personally! Jillian Hartsock on Facebook dressed up as an exhausted mom on Halloween, and her costume was on point. Her mother shared the costume on Facebook. 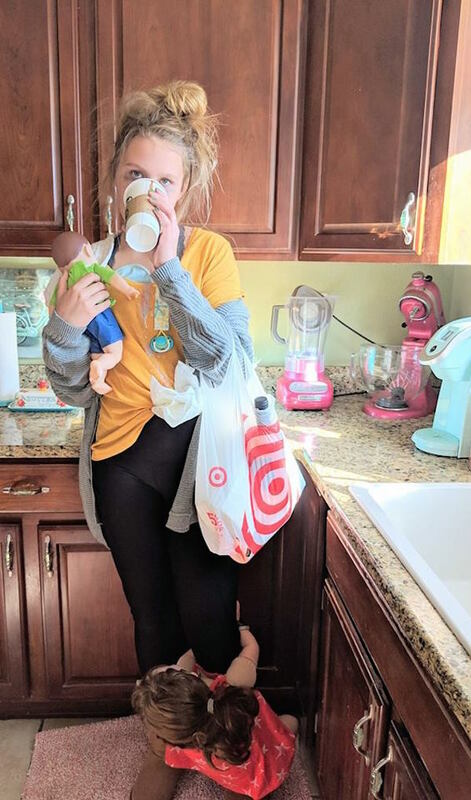 “Jillian’s ‘tired mom’ costume is literally EVERYTHING,’ her mother wrote. The post has over 39,000 likes, 8000 comments and almost 65,000 shares. Most of the audience are moms who can desperately relate to the little girl’s costume. Her costume was inspired by her own working mother, Lindsay Hartsock, who has several children and struggles as a “tired mom” along with being a business woman with her husband Kyle. The famous “messy bun” that shows how little moms care about how their hair looks. Dark circles from the exhaustion. The “I’ll kill you” glare. Starbucks coffee to help her get through the day. A grey oversized, but comfortable, sweater. A useless burp cloth that never helps with baby vomits. A hanging diaper because you always need one around. An obvious nursing pad, who hides them anymore? Baby wipes and wine – just the necessities. Black leggings. What were jeans, again? What did you dress up for on Halloween? Share with us in the comments below.